In the summer of 1864, the ongoing war against the Union leaves the Confederate capital of Richmond, Virginia jittery and dispirited. When Amanda, a lonely, young mother whose husband is away fighting for the Confederacy, meets a convalescing soldier, she welcomes the diversion. Her enchantment soon turns to panic when she discovers she is pregnant. Hiding the shameful secret from her husband and her neighbors consumes her. Cassie, the enslaved woman who works in Amanda's home, has no choice but to become involved in Amanda's decisions. As battles rage nearby, both women face increasingly fraught risks and consequences. Each one endures unimaginable hardships, fighting to protect what she holds most dear. Meanwhile, Amanda's husband, Edwin, tries to remain true to the Confederate cause. Told in historically rich, poetic detail, the story peels back the veneer of gentility to reveal the humanity of its characters at a time when Southern society is about to topple. The war drives the complicated bonds between husbands and wives, parents and children, masters and slaves, to a flash point. As Richmond veers towards its inexorable fall to the Union army, the novel exposes the forces behind the upheaval over slavery whose echoes continue today. Clara Silverstein, in this historical (and yet entirely contemporary and all-too-relevant) novel, brings a world, a place, a human experience to full life with her wild insight, her hot-wired imagination, and her boundless empathy--tempered with realism, infused with clarity. Her prose is poetry, but this lyricism never hides its truths. In this work we find the real to be as terrifying as we suspected, and the spiritual to be as sublime as we never dared hope. This is the book we need right now, and the writer whose vision for whom we've been waiting. You will read SECRETS IN A HOUSE DIVIDED without wanting to put it down, but you will return to it over and over again--looking for the beautiful sentences you highlighted, reliving the scenes that felt, as you read them, both feverish and hallucinatory, so visceral they might have been moments experienced in your own life. Nothing more can be asked from a writer, or from a reading experience. 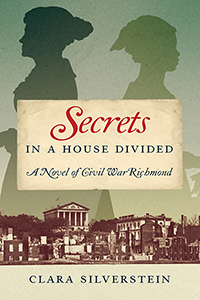 Like the best historical fiction, SECRETS IN A HOUSE DIVIDED, set in Civil War Richmond, is replete with details of the day-to-day lives of those impacted by the war. The story of Amanda Carter, a young mother left on her own while her husband fights for the Confederacy, is a story of struggle and ultimate redemption. Like all of us, Amanda is flawed and complicated; she is equally fascinating and resilient. Her relationship with her extremely capable slave Cassie as they navigate one obstacle after another, is the central relationship of Amanda's life. As Amanda grows and learns to accept herself for who she is, we consider our own capacity for honesty and forgiveness. Part love story, part tragedy, part war story, SECRETS IN A HOUSE DIVIDED is everything we want in a novel.